Newer Firefox 4.0 beta has neater looking universal access “Firefox” button. Using this single button you can access various options like print, save, history, help – which otherwise are displayed in menu bar at the top. If you still prefer the good old classic menu bar, you can easily remove the Firefox button and display full traditional menu bar in Firefox browser. While browsing any website, press ALT key. The classic menu bar will appear below the “Firefox button” temporarily allowing you to access menu bar options. 1. Launch Firefox 4.0 or above. 2. Click Firefox button and then goto Options > Menu Bar in the pop-up menu. This will activate Menu bar in Firefox 4 browser. You should able to see old style classic menu bar at top of Firefox 4 browser. 1. Open Firefox browser with classic Menu bar display. 3. Click to uncheck “Menu Bar” option. 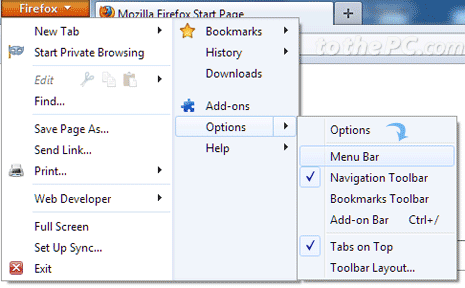 Firefox button will re-appear and classic Menu Bar will be removed. Does any of the information apply to Firefox 4.0 that is run under Mac OS-X?? 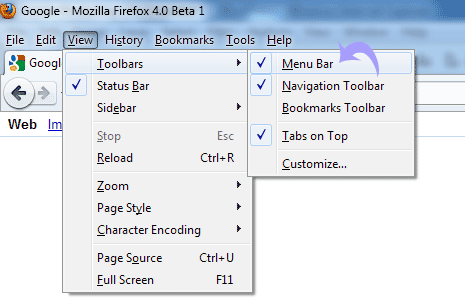 The released version of Firefox 4 uses Firefox > Options > click “Menu Bar” to add the menu bar, as noted with beta 9. This post is high enough up in Google results that it might be worth changing if possible. Thanks. I can’t stand ribbon and slak-bar interfaces. Good to know A REAL menu is still in there. Hope they NEVER NEVER NEVER remove that quality function the way MicroSHAFT did in Office. If you want Firefox button for Windows XP install Personal Menu add-on (addons.mozilla.org/en-us/firefox/addon/personal-menu/).